FREE Kirkland Signature Supreme Diaper Samples at Costco.com. You do not have to be a Costco member to receive this offer. Sorry, expired! 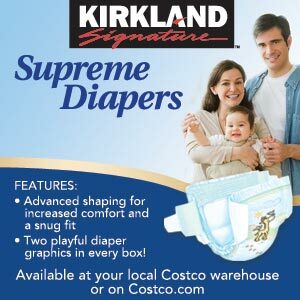 Kirkland Signature™ Supreme Diaper samples are only available on Costco.com. You may purchase cases of Kirkland Signature™ Supreme Diapers on Costco.com or at your local Costco Warehouse for a cash and carry price. Kirkland Signature™ Supreme Diapers feature advanced technology to provide your child with an outstanding fit, comfort and protection. We are confident that you will love the overall quality of our Kirkland Signature™ Supreme Diapers.